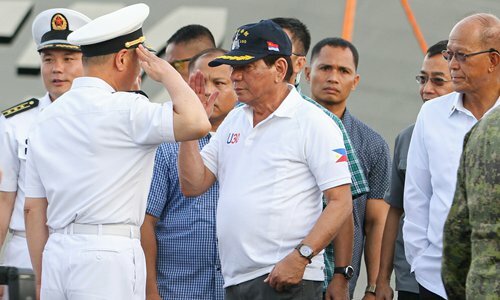 Philippine President Rodrigo Duterte on Monday visited a Chinese naval ship on a friendly visit to the Philippines, and said he is open to joint military exercises with China in Philippine waters. "I agree [to the idea]. You can have joint exercise here in Mindanao, maybe in the Sulu Sea," Duterte said after visiting one of three ships of the People's Liberation Army navy docked at Sasa Wharf in his hometown of Davao City, the Xinhua News Agency reported. Duterte boarded the guided missile destroyer Changchun, which arrived with the guided missile frigate Jingzhou and supply ship Chaohu. Duterte said he was impressed by the Chinese warship. "It's very impressive. It's all carpeted. It's so beautiful. Inside, it's like a luxury hotel," he told reporters, according to Xinhua. The Chinese ships arrived in the Philippines on Sunday for a three-day goodwill visit, the first Chinese naval fleet to make a port call to the Southeast Asian country in seven years, a sign of warming ties between the two countries. Duterte's visit came just one day after the Association of Southeast Asian Nations summit in the Philippines issued a joint statement refraining from criticizing China over "land reclamation and militarization" in the South China Sea. While on board the Changchun, Duterte told the media that the Chinese fleet's visit is part of "confidence building" between the two countries. The visit to Duterte's hometown rather than Manila is widely seen as a personal gesture to the Philippine leader. The visit is a clear sign that Duterte is improving Sino-Philippine ties after his predecessor, Benigno Aquino III, took the territorial disputes to an arbitration court in The Hague and sunk bilateral ties to an all-time low, Zhuang Guotu, head of the Center of Southeast Asian Studies at Xiamen University, said. "Duterte made it clear that Manila does not wish to challenge Beijing or engage in any form of military conflict. His primary concern is economic cooperation, for which he knows China's help would be crucial," Zhuang told the Global Times. Miao Hua, Political Commissar of the PLA navy, said at the welcoming ceremony that the visit would strengthen the relationship between the Chinese and Philippine navies, Xinhua reported. Jetmark Marcos, public affairs office chief of the Philippines' Eastern Mindanao Naval Forces, said the visit seeks to foster "camaraderie and mutual understanding" between the two countries through "naval diplomacy," Rappler reported. As Manila takes a friendlier attitude toward Beijing, the White House on Saturday announced that US President Donald Trump invited Duterte to Washington to "discuss the importance of the US-Philippines alliance." "Right now, both China and the US are extending olive branches to the Philippines. Duterte has played it well by treading a balance between the two powers to maximize Manila's interests. He managed to procure actual benefits from China while maintaining ties with the US," Zhuang said. He cited Duterte's handling of the ties as a good example to other Asian nations. Media reports in January said China had agreed to cooperate with the Philippines on 30 projects worth $3.7 billion on poverty reduction. Duterte is also expected to attend a summit in Beijing in mid-May on the One Belt and One Road initiative to increase trade and improve infrastructure ties between China, Asia and beyond. Filipinos interviewed by the Global Times said the territorial disputes in the South China Sea would not lead to a very serious problem. Celso, a shop employee in Manila, told the Global Times that he felt that "the problems are being dealt with." "We have a long history of friendship with China. Many Chinese traveled to the Philippines decades ago and established their businesses, creating jobs for the locals," Celso said. James Walkers, a Manila taxi driver, said the Philippines had a strong cultural bond with the US. "But President Duterte thinks the US is too far away, and why should we seek help from a faraway country instead of a close neighbor like China? Despite territorial disputes, no one wants to fight a war. Sharing can make us and our neighbors prosper," he told the Global Times.